Be aware. Your mileage may vary in this situation. I frequently see kids driving around with the name of one or another pizza place on their car and wonder if their parents checked out the insurance for the employer. You see, your personal auto policy does not cover business use. That is the job of a Business Auto policy and why it costs more. These kids are usually in a hurry to get the pizza to the customer on time, so the risk can be significant. On the other hand, I’ve read of court decisions that favored requiring the company with the personal auto policy to pay. Like so many other things in life, it depends. It depends on the wording of the policy, the jurisdiction, and the individual situation. One should first check with the employer. 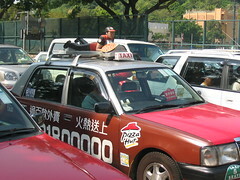 The pizza company should have Delivery Coverage to cover both the company and their drivers. This would be on either their business auto policy or their company liability policy. Many pizza places don’t have it and so you would by relying on your personal auto policy. If they don’t and your kid gets into an accident, your insurance company may deny the claim leaving you to foot the bill. These are questions that are best asked beforehand.